Photo: Screenshot of the HNA article. On January 16, 2019, the local German newspaper Hessische Niedersächsische Allgemeine (HNA) published an article on the development of the peace process in Colombia. The article reviewed the Conference entitled “Violence and sustainable solutions to conflicts in Latin America” (Gewalt und nachhaltige Konfliktlösungen in Lateinamerika), held at the Evangelische Akademie Hofgeismar, from 11 to 13 January 2019. During the Conference, the Academic Director of the CAPAZ Institute, Prof. Dr. Stefan Peters guided the discussion between Mrs. Danuta Sacher, director of the Latin America area of Bread for the World; Mr. Hans Peter Knudsen, Ambassador of Colombia in Germany, and the German politician and Commissioner of the German government for the peace process in Colombia, Mr. Tom Koenigs. 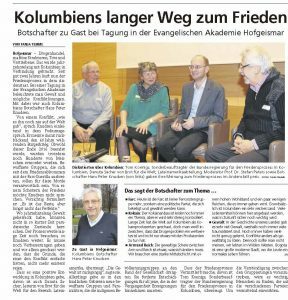 Read the full article entitled “Colombia’s long path to peace” (Kolumbiens langer Weg zum Frieden) published on January 16, 2019 in the HNA newspaper (in German).